A beautifully designed wedding band duo ring set. 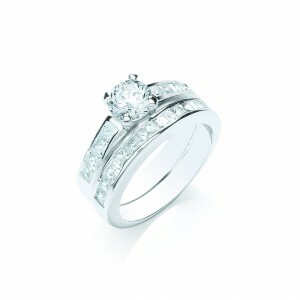 It comprises of a 6mm brilliant-cut clear cubic zirconia solitaire with 8 princess-cut (2mm) cubic zirconias on it's shoulders, plus a band ring containing 10 princess-cut (2mm) cubic zirconias. Available in sizes small (UK size L), medium (UK size O) and large (UK size Q). View our ring size conversion guide.